Damn, poor old Luther Vandross………..
Actually not that old of course. 54 years used to seem positively geriatric and completely in the unattainable future when I was a lad but now, for reasons that are becoming too obvious daily, it’s a sprightly young age that approaches in the now not too distant future. Its life, Jim, as we know it...it passes so quickly, far faster than we ever expect it to. I remember my mother telling me a couple of years back that, at seventy, she still felt eighteen….I’m damn sure I do and maybe that’s part of my problem…. So, to Luther….dead at 54. We all knew it was coming but it’s still sad as hell and a damn waste. Luther was bigger than life...any way you look at it, but beyond the girth and the physical presence came the voice, what he did with that voice, and way he changed the planet ever so slightly for the better. Smokey Robinson hailed Luther as one of the great voices, and coming from Smokey, in-arguably one the greatest vocalists ever (as I type the Miracles’ take on “I Heard It Through The Grapevine”, a favourite version of the song, has scarily started on the iPod), that is no mean praise…. 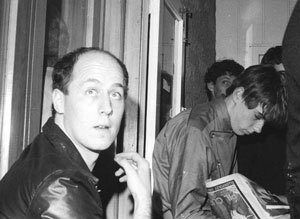 I first became aware of Luther (or “Loofa” as the soul boys with their white socks and loafers used to chant in the London streets in the eighties) about 1981 when, my then flatmate, Murray Cammick (we shared a flat for three years between 1980 and 1983…just us, 10,000 records, a decade of NMEs, boxes of other magazines and a cat called Ned…no TV, it didn’t seem important) started playing records in the house that featured THAT voice…records first of all by a group called Change and then solo records driven by the tautest driving (Marcus Miller) basslines and layered, exquisite, backing vocals that sounded like nothing I’d ever heard before, of for that matter, since. I took tapes of this astounding music (and other things I “borrowed” from Mo, like early Sugarhill and Enjoy 12”s) on tour with me as manager of The Screaming Meemees, confusing the be-Jesus out of the crowds in places like Matamata (but not Whakatane where a young Roger Perry recalls hearing the music through the PA in 1982). I had a swag of old Motown, James Brown, P-funk, Ch-lites and Philly singles and had been heavily exposed to Stax and disco, but Luther hit another nerve. And that nerve continued to be tweaked over the next decade. Common soul-boy purist wisdom holds that Luther’s best work was behind him by the mid eighties, by the time he released “Give Me the Reason” about 85. As with much perceived wisdom, this is complete elitist nonsense of course and is more about “I was into [insert artist] before the masses caught on, i.e. the artist became popular/ populist”, one of the driving principles of purist musical appreciation. Its true that the albums from the late eighties onwards became less rewarding but there were still tracks like the extraordinary Morales mix of “The Rush”; "Are You Using Me" with the Masters at Work from the late nineties (whose work in reviving so many timeless voices deserves greater recognition and is probably their greatest contribution to urban music since their golden, revolutionary, period ended a decade or so ago) and the lovely "Dance with my Father" from last year. I was always a sucker for the third party stuff too…his voice soars out of his work with Chic and Sister Sledge and makes Bowie’s “Fascination” (a Vandross co-write, which was also recorded by Luther as “Funky Music” on one of his rare mid seventies Cotillion albums, which I guess will now appear on CD…it was Luther himself who blocked re-issue) the seminal post-Ziggy-white-boy-goes-plastic-soul performance it is. I’m also a big fan of his rendition of “Georgie Porgy” (which leaves the ugly original by the bloated overrated pomp rockers, Toto, in the dust) with Charme on RCA from about 1981. The two albums he recorded with Aretha, using his band, and co-producer Marcus Miller (a crucial part of “Luther Vandross-the sound”) in the mid eighties are her best work (and only worthy work to be honest...she is notoriously difficult to work with if legend is to be believed ) since the mid seventies. Check out the semi-duet “Love me Right” if you have any doubt…especially good on the 12” mix. Luther also made it respectable for tough guys to like ballads again in a post punk world. Along with the likes of Alexander O’Neal (now, maybe MAW can put Alex in the studio again…) and Lillo Thomas, Vandross let hardened white kids, having cut their musical teeth on the likes of The Gang of Four, The Clash and PIL, listen to syrupy songs about love and passion without grimacing or blaming their girlfriends. Who said boys don’t cry? And probably more importantly, from an Auckland perspective, Luther was the soundtrack to a minor inner city revolution of sorts. In the mid eighties the first generation of New Zealand born Polynesian kids to come from the mass immigration of their parents in the sixties came of age and many of them started coming to the new generation of clubs in the city. They had links to via their families to American Samoa and Los Angeles and the nu-soul that was becoming pervasive amongst communities there. More than anyone else, Luther was their man and these kids and their sound drove clubland. From about 84 onwards Luther Vandross dominated the dancefloors and bars of High Street, Fort Street and Albert Street as these sophisticated, stylish kids from South and West Auckland came to town. Yep, as much as anyone, Luther was the sound of inner urban Auckland and it’s largely forgotten twenty years on. History is often written by press releases, and skewered by a lazy media, and personal agendas; and sometimes it needs to be re-written somewhat to reflect a more accurate past. Which is why it’s important to make a fuss about the re-union of Danse Macabre at the Kings Arms on July 22. Generally, I’m not one to get too excited about re-unions, I avoided the Blam Blam Blam reunion a year or two back despite my ties to the band (although I saw them finally about two months ago and, yeah, it was okay) and similarly was not inclined to see the Straightjackets although I’m a Carter fan…I guess I’d rather see his new band and listen to his old records from time to time. But the history of the early eighties has been largely re-written by the overwhelming legacy of Flying Nun and is largely inaccurate. There is no doubt that Roger’s label had a small presence but it wasn’t dominant in the Queen City during that period (and not really until the mid to late eighties when bands like Children’s Hour and the Headless Chooks made a statement….the early stuff sounded interesting but parochial….the South Island band that really mattered in Auckland then was The Gordons who were not a Flying Nun act as such), that perception comes from record companies and people who weren’t there. I suppose there may be an element of sour grapes but many of the musicians who battled away in the post punk period in Auckland maybe feel that something has slipped past. And there are also people who maybe haven’t had the recognition they are due. In particular I’m thinking of Trevor Reekie whose releases and production work for, firstly Terry Condon’s Stun label, and, more importantly, Glyn Tucker’s Reaction label and then his own Pagan Records were crucial and it’s fair to say that no-one has contributed more or worked at the creative cutting edge than Trevor over the past twenty five years. From the groundbreaking eighties electronica, to the series of quirky pop records later that decade, to his intuitive signings in the nineties & more recently (like Dub Asylum & Pluto) and his own work with Trip, well…hopefully you get the picture. Oh…and along the way he also discovered Bic Runga, Greg Johnson and The Strawpeople amongst others…. Which brings us back to Danse Macabre. Signed to Reaction and produced by Trevor, they were fairly much at the forefront of the post punk movement in Auckland. If AK79 was about the punk thing in Auckland (and it was more a post script to a movement which had more or less finished by late 79, than a signpost of where it was at…punk was 1977 to late 79 and the delineation was fairly clear at the time and is nowhere clearer than Nigel Russell’s move from The Spelling Mistakes, a Zwines punk act, to Danse Macabre, who could NEVER have played at Zwines), then the swag of indie releases from mid 1980 that began with The Features “City Scenes” showed us the way forward. The two EPs (now on CD) from Danse Macabre (Russell, Roddy Carlson, Ralph Crump and Wes Prince), like much of the music from that time may have worn their influences fairly squarely but added something else that could only have come from Auckland...it has a flavour and its pleasing to see how well much of this stuff has held up. Nigel and Trevor took this places later with the foolishly underrated Car Crash Set (“Imagination” is still one of the great NZ singles of the 80s and their other releases are close), but Danse Macabre are indicative of a time and place that’s now long gone but shouldn’t be forgotten.